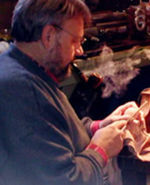 From Scott's website: For many years I dreamed of making my own pipe one day, and I finally did. It was christened as Etude #1, The Piano Tuner's Pipe. Many flaws and mistakes of course, but a wonderful and rewarding experience. I was hooked! New to pipe making, but loving it with a passion, and dedicating nearly every spare moment to either making pipes of my own, or studying the techniques and artistry of master pipe makers. My hope is to one day be among that elite group. For now, I'm hoping to soon be considered among the up and coming. 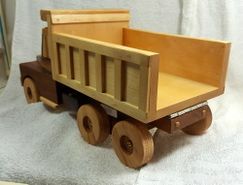 I'm essentially self-taught, but with constant help and feedback from members of the pipmakersforum.com. An amazing resource, several of the members are true masters of the craft, and amazingly generous in passing on their gifts to the rest of us. I am a piano tuner-technician and piano rebuilder by trade, as well as a musician. I love music and I find musical instruments and the materials they are made from beautiful and fascinating. The musicians, and the musical forms and compositions I work with are a great inspiration to me. 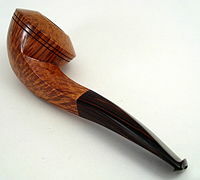 I hope to use musical elements and themes as inspiration in my pipe making. 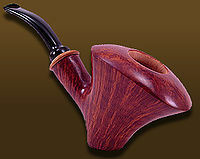 I also hope to use some exotic instrument materials as accents in my pipes. I think it’s safe to say that I never have, nor ever will be accused of being a “Will Rogers”. I have met men that I didn’t like and, though damned few, I have met pipe carvers with personalities that left me wondering how they could give away a stick of gum, much less sell a $1000(+) pipe. 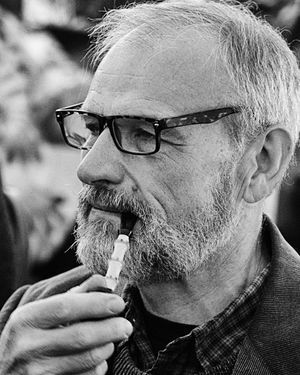 That said, the overwhelming majority of pipe artisans that I have known/interviewed, I have at least felt an affinity with, some (especially upon greater exposure) I have found to be incredibly cool to the point that it felt like I had discovered a kindred spirit. 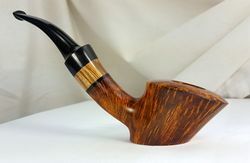 Then I began talking to a pipemaker, whom, within the first 45 minutes of what turned out to be about eight hours of conversation, I perceived such a degree of brotherhood, that it felt like I could burst into a room with a satchel, breathlessly blurt “Hide this! !”, run out, and know (after 5-7 years, 3 with good behavior) that the only change in its condition would be a patina of dust. 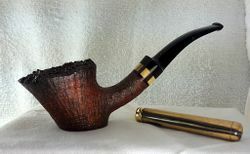 That pipemaker is Scott Thile and, contrary to the Leo Durocher misquote, this is one nice guy that will never finish last. Being the only person attached to marketing who was so out of touch with today’s pipe circuit that he didn’t know who Scott was, made me a natural candidate to conduct a ‘new to us’ interview. Having no preconceptions about the maker reduces the chance of subconsciously skewing questions in a manner that would emphasize preconceived strengths and downplay perceived weaknesses, in both the man and his craft. While, in theory, it’s the interviewer’s job to rapidly establish a sense of ease, from the start it was Scott’s geniality and enthusiasm that set the tone for relaxed conversation. Scott began smoking a pipe because an older colleague whom he admired, Charles Wheeler, smoked one and it seemed ‘incredibly cool’. Mr. Wheeler smoked Dunhill's 'My Mixture 965' and (thus) so did Scott, and '965' is still a staple in Thile's tobacco rotation today (Note: Actually, I'm pretty sure it was Dunhill 10, long since unavailable except for one coveted and vacuum sealed packet from my good friend, Michael DiCuccio's extensive tpbacco collection --sethile (talk) 09:54, 26 April 2018 (CDT)). 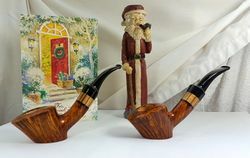 It wasn't until 2004 that the idea of carving a pipe started to have some appeal; being an adroit woodworker, pipe carving seemed like a natural extension of already present talents.. 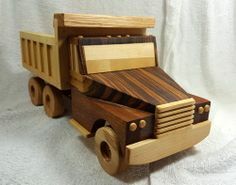 ....In the tradition of most aspiring American carvers, he started with a kit, and (again) like most first time carvers, he was horrified with the outcome. 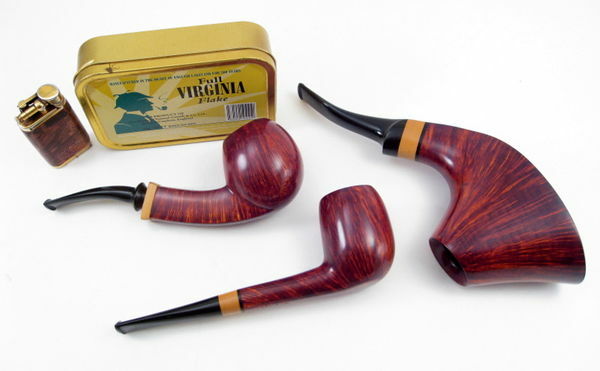 [I'm afraid I must correct Bear here, because I took some pride in the ugly pipe I made not being from a kit. 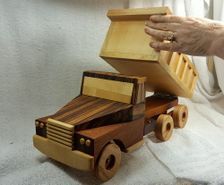 It was painstakingly drilled from a block on drill press using a modified vice I designed and built with the help of my friend Jim Barnet using a modified spade bit from Pimo, along with their tenon turning tool, which I used on a pre-molded stem. I faced the shank with a forstner bit. The mortise and draft hole were drilled with spur tipped wood drills --sethile (talk) 09:54, 26 April 2018 (CDT)) Scott, as I would soon come to find out, is a man who understands where his strengths lie, and he had little doubt that those strengths would eventually produce fine smoking instruments. Though his training has been largely autodidactic, Thile has spent time with Todd Johnson and Bruce Weaver and cites Todd and Adam Davidson as influences (Note: I'd be surprised if I left them out, but I should certainly have also mentioned Jeff Gracik and Brad Pohlmann as major influences as well --sethile (talk) 09:54, 26 April 2018 (CDT). When asked what overarching aesthetic holds the most influence/fascination for his inner artist, Scott's answer was as interesting as it was succinct, "The Danish neo-classics as interpreted by the North American greats." By the end of what (usually) would have constituted as the only interview, I had his basic biographical history, insights about his craft, visions as a pipemaker, plus a pleasantly daunting list of additional interests and passions which eerily coincided with mine. It turned out that we were within a couple of months of the same age, as enthusiastic about acoustic jazz as we were ambivalent about its ‘smooth’ cousin, and started smoking a pipe within about 45 days of each other. On a lark, as something of a fun test question to discover just how close some of our thinking processes worked, I asked. “Stuck in traffic, you notice a huge truck in front of you with a personalized license plate that reads “Stud19”. What’s your first thought?” “That there are another 18 idiots out there with ‘Stud” on their license plates?” Oh yeah, a fellow traveler on the highway of Snark. In addition, I came away with a ton of cool (and usable!) tidbits. Things like he has played the bass since he was young, continues to keep his hand in as a professional even today, and his son (Chris) is a very gifted mandolin player. Then came the marketing meeting. Ted: “Took a look at the notes, pretty good job Bear. I think that you should also include that Scott Thile started and has maintained Pipedia at considerable personal cost and labor” (Pipedia: the number one repository of pipe knowledge in the world, a priceless resource from which I stolen… erm, ‘researched’ a fair amount of information, and yet never took the time to find out who created the treasure). “I think that level of passion and selfless support to the pipe community is something all of our customers can get behind”. Now sporting what Vietnam vets referred to as the “thousand meter stare”, I replied something like “Yup, mmmhmm, that they would”, and added “Call Scott” to my must-do list. Please don’t misunderstand, I was the cocky pratt who walked into a marketing meeting with only a partial glimpse of the immense talent that laid within a remarkable man and, to my mind, Scott’s combination of natural modesty and ‘just is’ mindset makes him all that more exceptional. 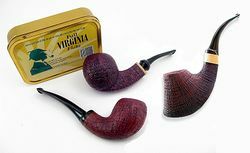 After more than 33 years of association with pipe retail, I can declare that collectors will naturally gravitate to the carvers who not only create magnificent pipes, but who are extremely likable as well. Having described Thile’s work and having talked extensively with the man himself, I’m quite confident that this already popular carver will become a universal favorite. 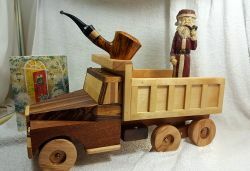 Some years ago, I started a tradition of making pipes for my three sons at Christmastime, and then added a Christmas Truck to the tradition for my Grandson. 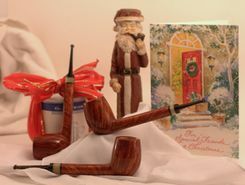 Several years I added pens made from briar and ebonite with accents matching those used in the pipes so I could include my father and mother in homemade gifting, while trying to foster a unified theme throughout the items. Some years are more successful than others ;) --sethile (talk) 09:54, 26 April 2018 (CDT) . 2013 Christmas Pipes (You'll not a bamboo shank snuck in here. That was from breaking off a shank, and turned into a Christmas pipe for me that year! 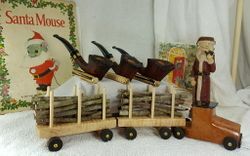 2010 Christmas Pipes, The first year of the tradition, and the only year with the pipes being different shapes. This page was last edited on 26 April 2018, at 09:54.